Brand new album from my favorite noise outfit. This is just pure experimental jazz at the fringes of reason and sanity. Jim Sauter and Don Dietrich have been playing saxophone together since they were in junior high school, and playing with guitarist Donald Miller under the Borbetomagus name since 1979. There have been the occasional other members, most notably bassist Adam Nodelman who passed away back in 2008. They have collaborated with other noise luminaries such as Voice Crack and Hijokaidan over the years, and all three have been involved with other outside projects as well. Make no mistake, these guys can actually play their instruments, and know exactly what they are doing. This isn't just chaos happening here. One of the best things I've noticed so far on this new record is the way Miller's guitar is front and center in the mix. His experimentation with feedback in the clip I've linked below is just amazing to me. If noise is your thing, and you ever get the chance to see the guys play live, do not pass it up! Their shows are some of the loudest I have ever heard, and are just the stuff of legend. ^Top notch breakdown man, thanks for that review. Some heavy skronk and noise for sure. I keep saying this but you're posting stuff that I've meant to check out for a long time. I'd probably need serious ear protection for the live show. 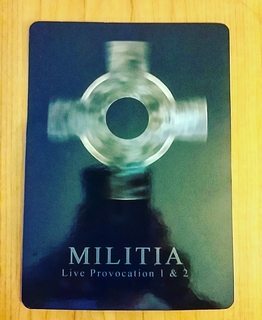 Militia are a Belgian industrial group formed in the late 80s, seemingly influenced by things like early SPK and Test Dept. This tape is some of the earliest material they have released and is taken from a 1989 radio broadcast, but was not released until 2010. Here, rather than a group performance, these pieces are solo work by Frank Gorissen. Compared to some of the other Militia stuff I have, this is a lot more atmospheric. There is a some junk metal clang and scraping noise, some percussive parts, but on the whole it's more of a mood piece. Not the kind of thing to grab you right away but worth putting some effort into. This tape was limited to 100 copies and is now sold out, but don't pay silly Discogs/eBay prices. Check noise/industrial distros for deadstock as some place probably has a copy still. No soundclips, so I am posting a live video from 2010. I like what they're doing in that video clip. I've always been interested in that sort of industrial stuff where they're making actual music from non-instruments. I've heard a lot of tapes from Soviet-bloc era Eastern Europe along those lines. Pretty neat to see Belgians doing something similar.